Pendulum Clocks and How they work. 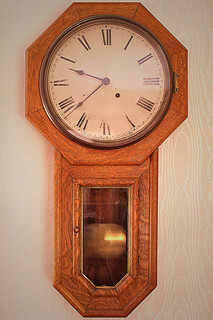 Pendulum clocks are admired today mostly for their antique and decorative value, but for several hundred years they were the most widely used and most accurate timepieces in the world. The 16th century scientist Galileo first realized that pendulums could keep accurate time, although the invention of the first pendulum clock is credited to the Dutch scientist Huygens, in 1656. All these clocks contain the same components and work in much the same way. The most important part is the pendulum itself, which is a weight attached to the end of a long rod, which swings due to gravity. A device called an escapement then transmits energy to the pendulum, causing it to swing in regular measured intervals, which in turn causes the hands of the clock to move – thus measuring time. A gear train (also called a wheel train) increases the speed of this power in order for the pendulum to use it. Some more elaborate clocks also use a device called a striking train to produce a chime every hour, or quarter hour. Some older clocks also contain a repeater, which plays the chimes when pressed – a useful device for telling the time in the dark. One problem is that the length of a pendulum’s swing will vary as the temperature changes - during the 18th century, the grid pendulum was devised, which used the theory of differential expansion of steel and brass to ensure that the pendulum’s swing distance did not change. More progress was made during the late 19th century as it was realized that a pendulum operating in a vacuum would be even more accurate. For a simple device, the pendulum has been surprisingly useful over the years. Not only did it revolutionize the way we measure time; it has also been used to detect earth tremors and to demonstrate the rotation of the earth.